1. Rinse the rice until the water runs clear. Put in a pan with 220ml water. Bring to the boil, then cover and simmer for 12 minutes, until the water has been absorbed. Set aside for 10 minutes. 2. Meanwhile, in a small bowl, stir together the sriracha, rice vinegar, soy sauce and sesame oil. Heat ½ tbsp vegetable oil in a wok. Stir-fry the onion with a pinch of salt over a medium- high heat for 5 minutes, until soft. Push to the side of the wok and stir-fry the vegetables for 1-2 minutes. Take off the heat. 3. Heat the remaining ½ tbsp oil in a frying pan; fry the eggs until the white is set and crispy at the edges. 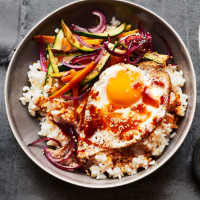 Divide the rice between 2 large bowls; top each with the vegetables and a fried egg, plus the sauce and sesame seeds before serving. This recipe was first published in Thu Feb 01 15:05:00 GMT 2018.